While most of us don’t go out of their way to install third-party contact manager app, but there are times when you need one. Maybe your contact app is showing duplicate contacts, or you need extra features like backup, better search, and caller ID. A quick search on Google Play Store results in heaps of Contact manager apps. However, finding the right one for you might take some time. But fret not, we did the hard work of testing all the best contact manager apps, try to find out, how they are different from each other, and which one is best for which users. If you have a Pixel, Nexus or Android One phone, it already comes with Google Contacts built in. But in case you don’t own these devices, you can still download the Google contacts app from the Play Store. Once installed, whenever you add a new contact from your phone, it automatically gets synced it to your Gmail address book. Another handy feature of Google Contacts is Labels. 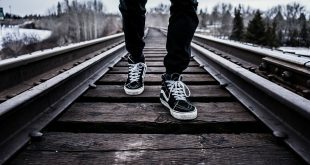 Labels are just like groups which help in the easy discovery of a contact. You can add as many contacts and assign them a label like work, club, etc and it would suggest all the contacts when you search for them. You can add multiple Google accounts on your account and keep the contacts exclusive to an account which is very thoughtful as often mix up my work contacts with my personal contacts. Google contact app is pretty good, but if you rather not use it for privacy concerns, then try Simple Contacts. Simple contacts is an open source app. To maintain transparency, this app doesn’t upload your contacts to any cloud servers but you can choose to sync them with your Google account. The contacts remain on your phone and if you want you can generate a VCF file to export contacts out of your phone. The settings tab does offer a lot of customization, for example, you can customize the colors of the text, manage contact fields, disable/ show thumbnails, etc. You can also favorite contacts and arrange them in groups. It does include a minimalistic dialer which sits well on hands. While you can remove (or merge) duplicate contact with new Contacts section on your browser via Gmail, but doing it directly on Android is much easier. Contacts optimizer helps you to find duplicates contacts and remove them with its advanced duplication removal technology. The optimization wizard takes the wheel and does all the hard work automatically. It analyzes your contacts looks for corrections and offers modifications. 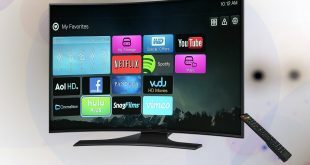 You can choose to allow or discard changes which give the user more control. 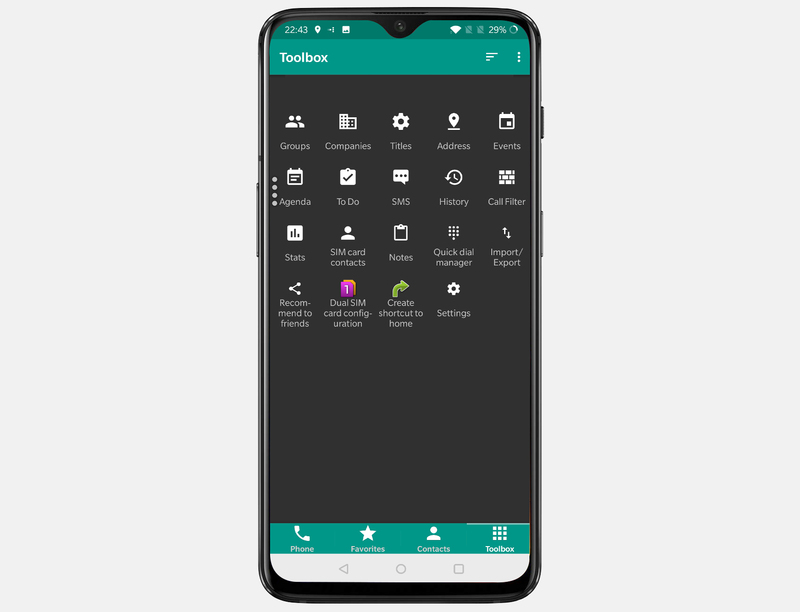 The edit toolbar is an efficient way to fix your phonebook quickly, just long press and choose an action such as edit, copy, and move. The even more powerful Toolbox has multiple operations like backup, restore, duplicates and merging, accounts processing, and advanced optimization. You can transform your contacts with ease considering you get so many professional tools in this app. 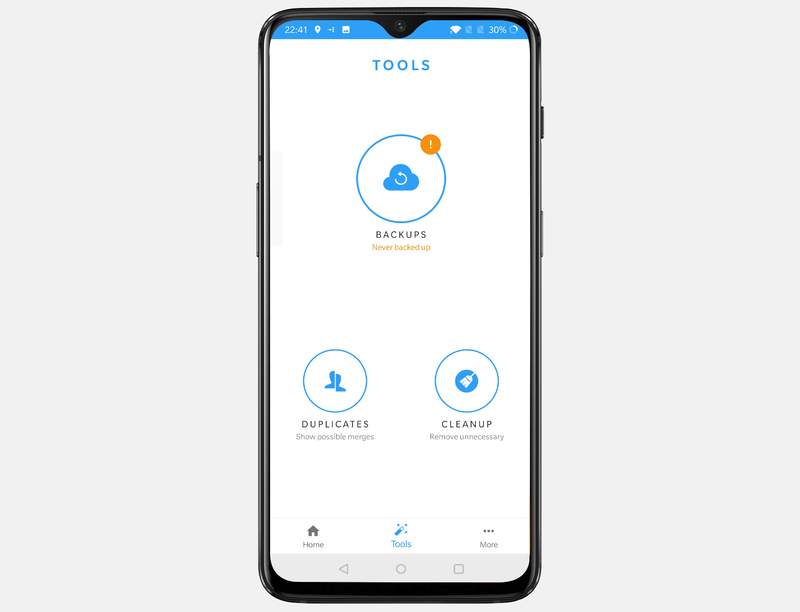 The app is free on the Play Store and does not show any ads, however, if you require advanced tools you can purchase the pro version for $1.99. 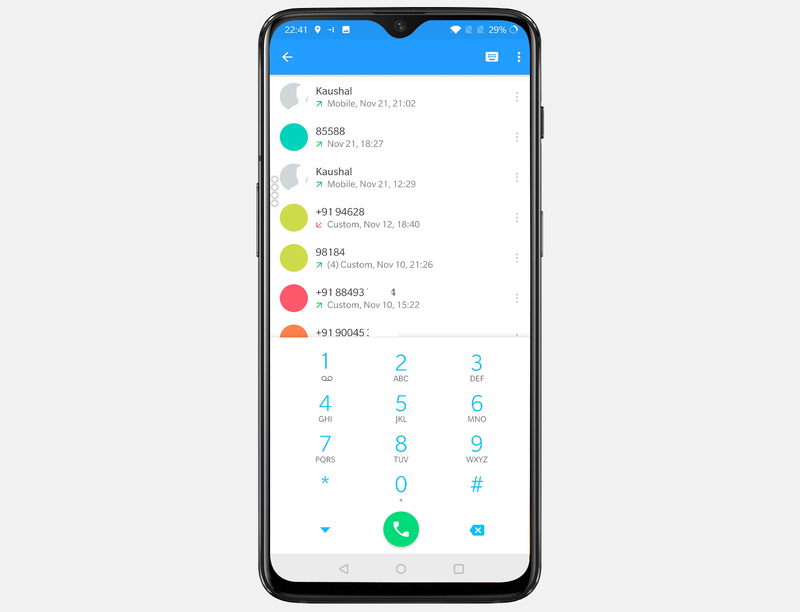 Simpler dialer is a contacts app which features an onboard dialer within its interface. The app shows you your call history with all the incoming, outgoing, and missed calls. The interesting thing about this app is its inbuilt caller ID. It scans the unsaved numbers from its own database and shows a name if it matches. This probably means your data would be saved with the app’s cloud servers for better usability. You also get a one-touch button to add contacts to your phone in the recent tab. 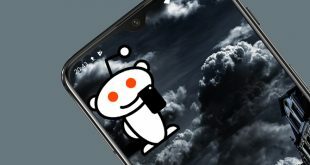 This app has three major tools which make this app worthy of this list. Backups, duplicates, and clean up. These automate the whole process and do the job with a tap of a button. If you have duplicates in your contacts list, it can be removed. The cleanup button removes any contacts without a number, no email, or if it is unused for a while. The app is free on the play store. Contact+ is one of the more popular contact apps on the play store and for a good reason. It handles your calls, contacts, and SMS in one app seamlessly. You can swipe across tabs to get information on call logs, and messages. Additional to caller ID you can also block spam calls with this app. It automatically detects the potential spammer and blocks it. It also blocks SMS and reduces the clutter from your phone. 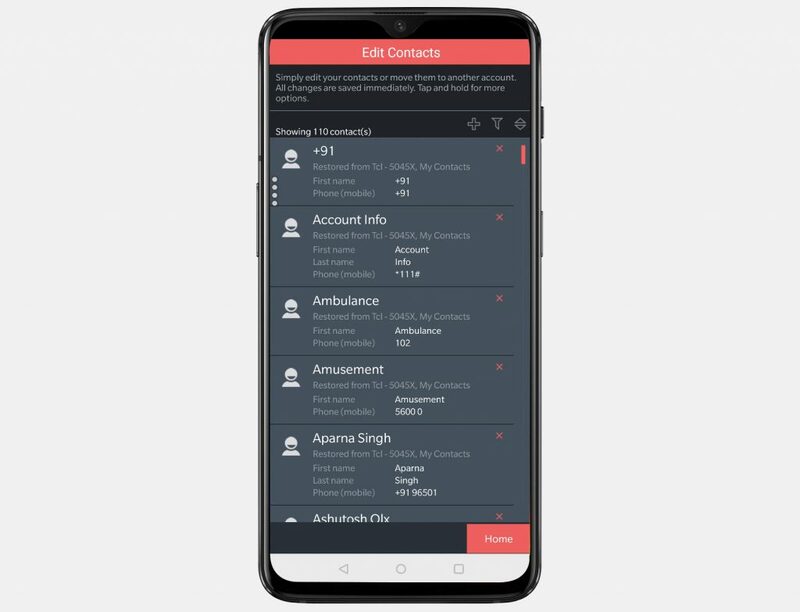 There are many features which include speed dial screen with one touch to call, fast dialer search, smart contacts sort Grid/List contacts view, and smart cards integrated with your contacts. The app offers multiple customization themes and you can choose up to 4 themes in the free version. You can backup up to 500 contacts, 500 SMS, and 500 calls on the free account. Though it has monthly and yearly subscriptions but I don’t think you would need it unless you handle more than a thousand contacts on your phone. The app is free to download on the Play Store and you would be able to use it with the free subscription for personal use. The monthly subscription costs $ 1.99/mo for professionals. Drupe has the most interesting UI among all the contacts apps. The apps floating icon sits on the edge of the screen as 3 vertical dots. To invoke the app, just swipe right on the translucent triple-dot. 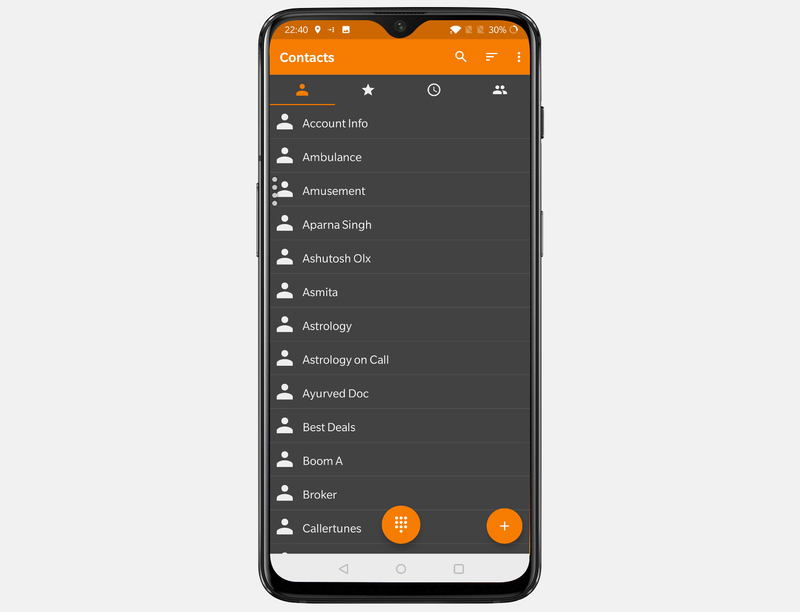 A list of your favorite contacts will appear along the left side of your phone’s screen, with corresponding options such as new call, text, email etc. on the right side. Just drag a contact to the app icon to initiate a conversation. It also has an option of GIF call which sends GIFs during video calls based on context. The app can also be customized with various themes like stars, leather, metal but these are locked behind a paywall. One additional feature is call recorder which seamlessly records all incoming and outgoing calls and saves it to your phone. You can, however, disable this feature if you want from the settings page. It has smart reminders which allow you to set contact-based reminders on the app. When the reminder goes off, it gives you a dialog screen with multiple apps option to contact them. The app is free to use for the most part. The only caveat though is the annoying ads that sit in the middle of the screen and urges you to purchase the pro version. You can take a monthly or half-yearly subscription at $4 and $11.99 respectively or you can buy it for life at $14.99 which in my opinion is understandable. Plus they give you a 20% discount if you bargain. Really, when you press the cross button to go back to the app it asks you for a reason, tap ‘price is too high’ and it offers you a deal at $11.99 for a lifetime subscription. App Dialer is not exactly a contacts app but it does something ingenious nevertheless. This app is a quick search tool to search for apps and contacts on your phone. This app opens a quick widget right on the screen and searches for the apps as you type. Sure I could use the native search bar on the top in the app drawer but this app is just blazing fast. Plus it can also search for contacts simultaneously which the app drawer can’t. Though you might have to first enable it in the settings page when you use this app for the first time. The app is free on the Play store and you can download it here. DW Contacts is another open source app and has an extensive list of tools to make you contacts optimized. You can search for contacts by any field of contact, write notes and set reminders. The app speaks caller ID whenever you receive a call and you can set a missed call ringtone. It has a feature of batch messaging with which you can send a text, MMS, email to multiple contacts and groups in a single go. Also, you can log notes to your contact log on this app. Call filtering is active by default and it also shows you a call statistics at the end of the call. 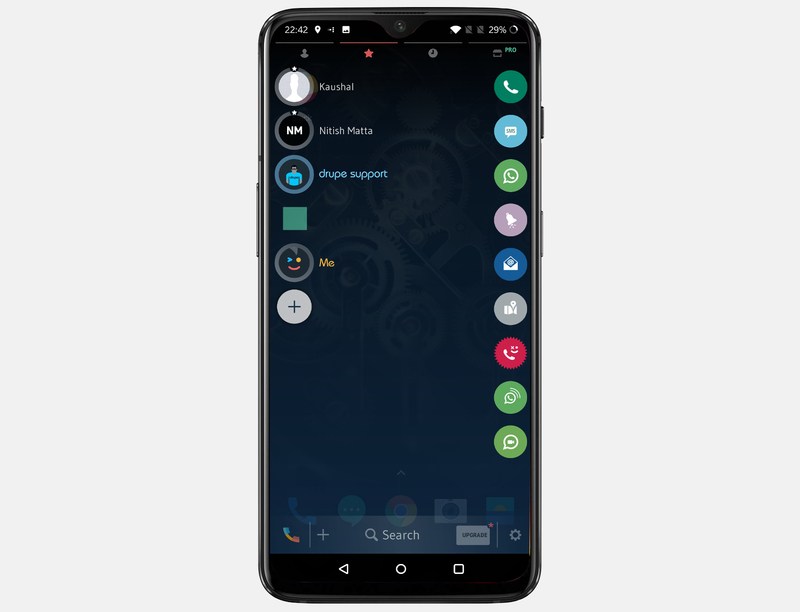 The quick dial manager on the app works efficiently and you can store up to 1000 contacts on speed dial, not sure why but its there. You also get T9 search on the dialer which is great considering it reduces search time significantly. Although the app is free there are some limitations on it like ads, limited themes, only one app widget. You can purchase the full version for $10 which gives you a lifetime license to use the app. The best Contact Manager app Android? Google contacts is a simple and reliable contacts app which offers sync an backup using your google account while simple contacts also offer the same functionality, it is for people who prefer everything open source. 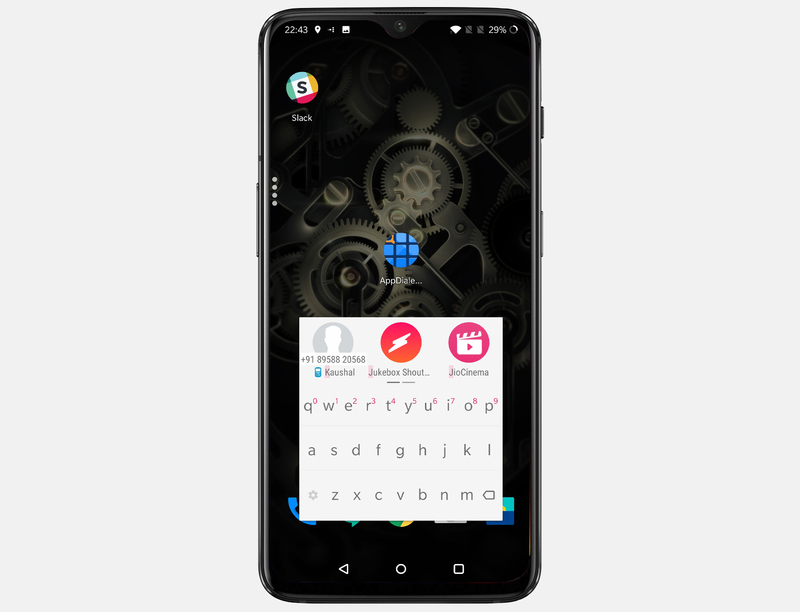 Drupe offers gestures and third-party app integration with swipe gestures which is a great feature in my opinion, while the Contact Optimizer offers tools to streamline your address book. DW is, in my opinion, an all-round contacts app with most of the features which provide a practical implication. 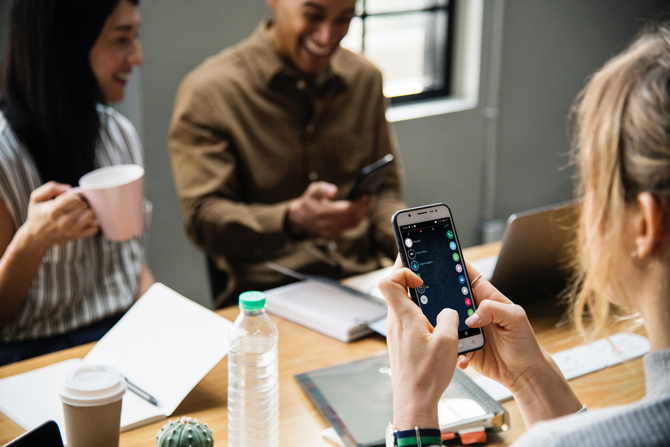 There are other apps that deserve a mention in this list as well, such as EyeCon, which sync your social media to create a detailed contacts list and Ready Contacts and Dialer, that sort your contacts in a smart way. Tell us which app do you like the most in the comments below.